Cardiff city life can be quite hectic for the locals as well as tourists making it necessary for the need for wholesome entertainment to keep the spirits going. There are many entertainment and leisure avenues in Cardiff - art galleries, clubs and bars, restaurants, film and cinema. Albany GalleryIt was established in 1965 and is recognized, as one of Cardiff's successful and long established privately owned commercial art gallery. The top floor of the gallery displays an exhibition of paintings, prints, sculpture and ceramics by gallery artists, providing high quality contemporary fine and applied art. Prices range from ?50 - ?30,000. The gallery provides a friendly and informal atmosphere where visitors feel at home. La Mostra GalleryIt is Cardiff's first commercial art gallery to house international paintings, sculptures and artifacts. The Gallery is an exhibition space in which visitors and artists can interact. It has become a center of cultural communication. 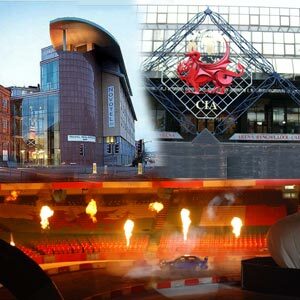 Cardiff also provides a plethora of leisure activities for fun seekers like bowling, ice-skating, carting, skate boarding, bird watching and surfing. Cardiff has a variety of television channels, local as well as national, which cater to varying tastes of the viewers. The programs that are relayed vary from soap operas to educational programs, kid's programs and movie-based programs. Radios with their round- the- clock programs provide a great source of entertainment for listeners. Normally radios provide unplugged music, which may be contemporary or belonging to a certain genre like pop, jazz or blues. Cardiff has innumerable radio stations, which cater mainly to the entertainment needs of travelling listeners.